At the invitation of State Councilor and Foreign Minister Wang Yi, Foreign Minister of the Portuguese Republic Augusto Santos Silva will pay an official visit to China from October 18 to 23. Q: According to reports, on October 15, Canadian Prime Minister Justin Trudeau said at the Fortune Global Forum 2018 in Toronto that his country will continue to take various measures to strengthen trade relations with China. "Obviously, China is the world's second largest economy and growing and will remain an important place to do business and seek opportunities." In addition, when giving an interview to Fortune, Trudeau said that in the past few years, Canada has been strengthening its trade ties with China and it will continue to do so. Prime Minister Trudeau also mentioned China-Canada free trade agreement talks. What is your comment? A: I have noted relevant reports. The Chinese side appreciates the relevant statements made by the Canadian leader. As important economies in the Asia-Pacific region, China and Canada are highly complementary in economy and enjoy huge potential and broad prospects for cooperation. China stands ready to work with Canada to continuously promote the construction of the China-Canada free trade area in a practical and open manner, deepen practical cooperation in economy, trade and other areas and achieve new progress in China-Canada strategic partnership. Q: The US leader recently alleged that China is using "debt diplomacy" to expand its influence worldwide. In his visit to Vietnam, the US defence chief singled out what he described as "predatory economic behavior" by China, saying it would pile massive debts on smaller countries which are going to have difficulty repaying them. What's your comment? A: Though faced with a large amount of facts and statistics, the US has fabricated lies time and again and made irresponsible remarks out of its political needs, which is very disappointing. As we all know, insufficient industrial capacity, lack of self-reliant development capability, backward infrastructure and financing difficulties constitute bottlenecks for the development of many underdeveloped countries. Having faced the same problems over quite a long time, China shares the feelings of these developing countries. So we know their pressing needs and have conducted mutually beneficial cooperation with these countries under the principle of upholding justice while pursuing shared interests and provided assistance much needed to developing countries with no political strings attached based on our own experience. All this cooperation has forcefully promoted the socio-economic development and improved the livelihood in relevant countries. For instance, the Mombasa-Nairobi Railway funded and built by China has created around 50,000 jobs for Kenya. The China-Pakistan Economic Corridor (CPEC) contributed 2.5 percentage points to Pakistan's GDP growth in 2016. Such cooperation is indeed well received in developing countries. Frankly speaking, developing countries once hoped that developed countries who are more capable of offering help, the US included, would provide such assistance, make good on their promises and offer concrete assistance without any political strings attached in accordance with the needs of those developing countries. The relevant country, if it cannot meet that hope, should at least refrain from obstructing others from assisting these developing countries, even less hurting the benefits of these people to serve its own political needs. This is just immoral. The US has constantly made an issue out of the so-called debt problem in disregard of facts. The truth is that, in the relevant regions and countries the US side and certain media have frequently cited to play up the issue, only a small proportion of their debts is incurred by cooperation projects with China and we have never heard of any single country fallen into "debt traps" due to its cooperation with China. Here are some more examples I would like to share with you. Sri Lanka has been a case repeatedly played up by some foreign media recently. But by 2017, Chinese loans only accounted for around 10% of Sri Lanka's foreign debts; China's loans to the Philippines made up only less than 1% of its foreign debts. Sri Lanka's Ambassador to China clearly said that the allegation of the Chinese government dragging his country into "debt traps" is entirely wrong. And recently the Finance Secretary of Pakistan also refuted US remarks that the CPEC has caused Pakistan's debt crisis. I believe these countries have the best say over these issues. At the successful Beijing Summit of the Forum on China-Africa Cooperation and the 73rd session of the UN General Assembly not long ago, leaders of many African countries came forward to refute the fallacy that the China-Africa cooperation has aggravated Africa's debt burden, pointing out that their countries in urgent need of capitals are aspiring for development and cooperation. The support and assistance China has offered have no political strings attached at all and does not interfere in their domestic affairs. They welcome and appreciate what China has done, and commend China as Africa's most trustworthy partner in the continent's pursuit of development and revitalization. These statistics and examples do speak volumes. The US attempt to pin a false label on China is just unpopular. We urge the US side to put in perspective China's cooperation with other developing countries. Moreover, we would like to see the US making more useful contributions to the development of developing countries instead of sowing discords. Q: It is reported that on October 15, US research vessel Thomas G. Thompson docked at the port of Kaohsiung. Although this ship is part of the US Navy assets, it has been used by non-governmental organizations. What is your comment? A: We have noted relevant reports and are expressing our grave concerns to the US side. I would like to reiterate that the Chinese side is firmly opposed to any form of military ties between the US and Taiwan. 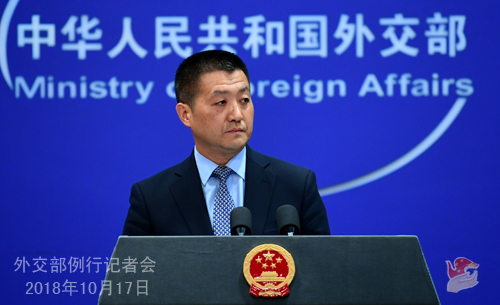 We urge the US to earnestly abide by the one-China principle and the three China-US joint communiques, stop any form of official exchanges and military ties with Taiwan and prudently and properly handle Taiwan-related issues. Q: First, on October 15, the Russian Orthodox Church held the Holy Synod's meeting in Minsk. After the meeting, it said that it would sever all ties with the obstinate Ecumenical Patriarch of Constantinople in protest against the latter's support for the Ukrainian church's independence. It is learned that there are over 15,000 Orthodox believers in China. What is the Foreign Ministry's comment on the confrontation between the Russian Orthodox Church and the Ecumenical Patriarch of Constantinople? 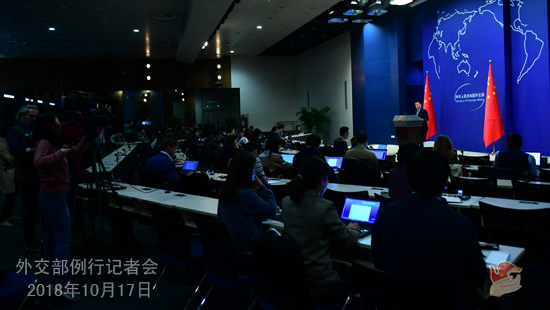 Second, according to the report released by the United Nations Conference on Trade and Development on October 15, in the first half of this year, the foreign direct investment (FDI) China attracted grew by 6% against all odds, exceeding $ 70 billion, which makes China the world's biggest FDI recipient. Does this mean that the US ratcheting up pressure on China will not harm China's economic and trade cooperation with other countries? A: As to your first question, if my memory serves me correctly, you raised this question yesterday. We are in contact with the National Religious Affairs Administration and other departments for more information. For your second question, in fact, besides the United Nations Conference on Trade and Development, the relevant Chinese competent authorities recently also released some figures on China's macro-economy which showed that although China's economic development is faced with some uncertainties both internally and externally, China's economic fundamentals do remain sound in a long term. We are fully confident about this. As to what you asked about whether other countries in the world will maintain or even expand cooperation in such areas as economy, trade and investment with China under the current circumstances, I think that all countries and businesses would base their policy choices on their own fundamental interests and I believe that choices made in this way will be right ones. Q: On October 17, Japanese Prime Minister Shinzo Abe sent a "masakaki" ritual offering to the Yasukuni Shrine. What is your comment? A: The Yasukuni Shrine commemorates Class-A war criminals of the WWII who are directly responsible for the war of aggression. We consistently oppose such wrong action by the Japanese side. 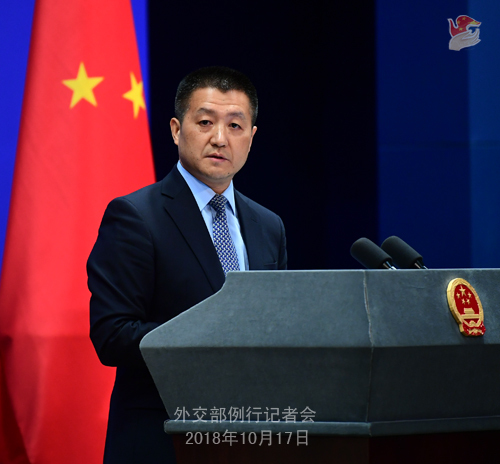 China urges Japan to squarely face and show deep remorse for the history of aggression and win back the trust of its Asian neighbors and the international community with concrete actions.